I had a list of things to do today like we all do. Just some background info....I'm great at making lists but not so good with the follow through. I make lists at work and stick them in my bag. When I get home I plop on the couch or go out in the garden and forget to pull the list out of my bag to see what I was supposed to do. Sometimes I type my lists on the computer. Looks great and it's fun to work with the different text fonts I've found but if you don't print it out.......well you get the idea. Okay, back to today. Our office has switched to our summer hours. We work 9 hours Monday thru Thursday and work only 4 hours on Friday morning. Everyone loves it. I get to go home at 12:00 and cut the grass for several hours. It's not so bad. I sit behind a computer all day at work so it's nice to get some exercise and it's instant gratification. Anyway, I get home from work after stopping by the grocery store, change into my grass-cutting clothes and decide to check my email. 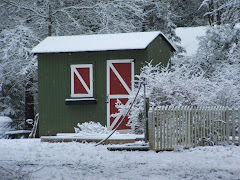 Nothing, no email, no internet, and no cable tv. After wasting several hours waiting for the cable guys to come out, I was finally connected to the rest of the world. I quickly cut half of the grass and rushed inside to have my Rudy Day. I met Cathymac's challenge and listed what I wanted to do for the other Rudy Day's the rest of the year. I put a little twist on it by assigning a different theme for each month. 12 days of Christmas - how will it work? The tabs I had put in my Christmas notebook were glued in the first time. They all fell out. Lesson learned. I punched holes and attached them with miniature brads. Much cuter and I'm sure they will stay in. And the big thing the today was starting my first blog. This is going to be fun! 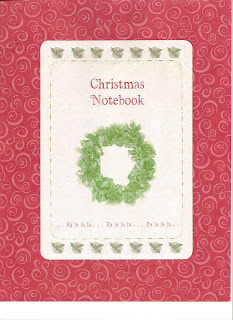 One of the reasons for starting a blog was I HAD to show off my Christmas notebook cover. It's taken over a year to complete it. 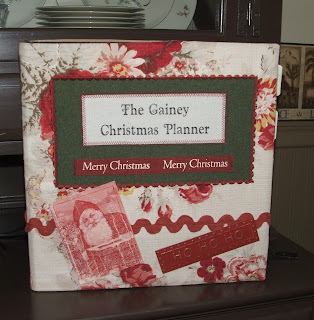 I started with a 2" 3-ring binder that I covered with a great Waverly fabric. It stayed that way until this past January. Sometimes I have to let things sit for a while and stare at me while I stare at them. Then one day a light bulb will come on and I'll know how to finish them but, boy, it sure can be frustrating waiting for that darn light bulb to come on. The Santa picture I got off the internet and changed in Word to shades of red (it was a regular picture with a gazillion colors when I found it). It's printed on cardstock and sewn straight on the cover. The HO HO HO is metal from the scrapbook section of a local store. The rest is sewn on fabric and the text run through the printer on muslin. These two pictures are of the section dividers. I made them in Publisher, printed them out and pasted them on pretty scrapbook paper. They always look better in person. But all the section covers look like the one on the left. I've always enjoyed Christmas. The decorations, the flurry and, of course, the real meaning but always felt let down on December 26. It was all over in a flash. All the planning and doing was gone in a minute. 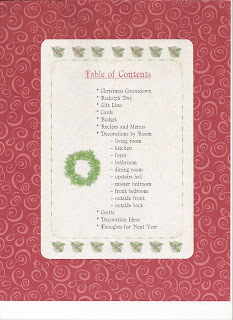 Finally I found the OC ...not the tv show but the Organized Christmas website. I don't even know how I found it but I did. And they had this wonderful thing called Rudolph Day....Rudy Day to most of us.....that lets you think, plan, dream about Christmas at least once a month on the 25th. And the best thing was I found more people out there just like me ! Crazy about all things Christmas. Well, almost obsessive. But to my family and friends that think I'm nuts half the time, I just want you to know there is no cure for it so don't try to find one. I wouldn't want the cure if you could find one anyway.